Not any more expansive external Thumbnails services. It is time, with SneakScript, to create YOUR OWN Snapshot platform for all your Web Projects. 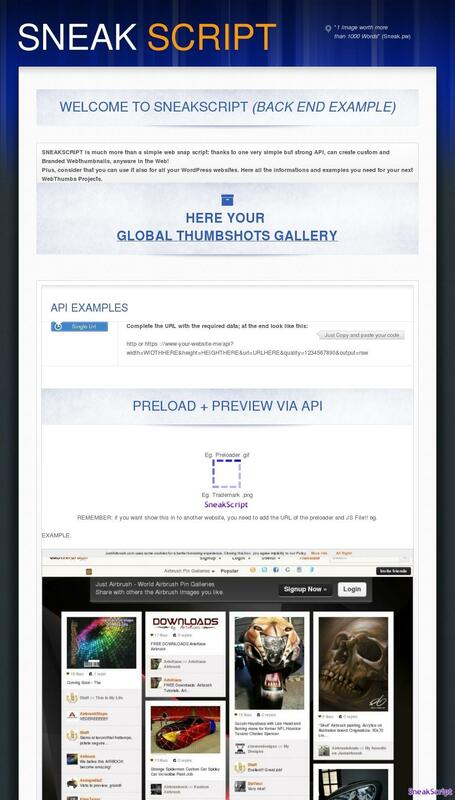 Transform your VPS in to the Ultimate Web Thumbnails Solution. Use it on all your websites: copy and paste 1 line of code! All right, SneakScript is pretty cool, because users can see immediately that the site look like, without having to read text…. but where can I use it? Applications can be manifold and range from personal site up to multi-portal. Today, for obtain a nice Snapshot, you have to spend hundreds each month in subscriptions with external Web Thumbnails service. Instead, you can have MINIMUM the same results for a fraction of the cost! SneakScript include also the exclusive WordPress Plugin (Test It! ); just add the URL of your API, done!